Note: For information about supported languages for the PureCloud user interface, see PureCloud language support. Architect currently supports the PureCloud supported languages as listed for user interface (UI), speech recognition, text-to-speech, IVR system prompts, and telephony user interface (TUI). However, you can create call flows in many other languages. From a call flow’s main page, choose supported languages in the Settings area. 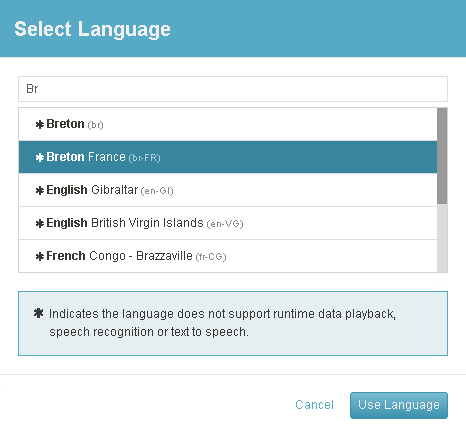 When you select a language, Architect returns a message if it does not support runtime data playback, speech recognition, or TTS playback for the selected language. 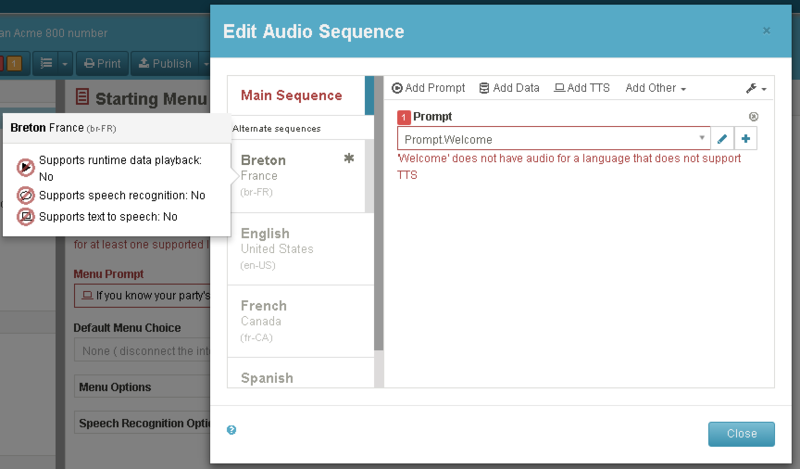 When you edit an audio sequence, Architect provides immediate feedback for any languages that are missing audio or TTS resources. Architect also indicates whether a language does not support run time data playback, speech recognition, or TTS.